Freon Again? | VANKLEEF HEATING AND AIR CONDITIONING , INC. I need some Freon again. Far too frequently, we receive the call from our customers requesting more freon. Hmm. Not good. Air conditioning systems are sealed systems. 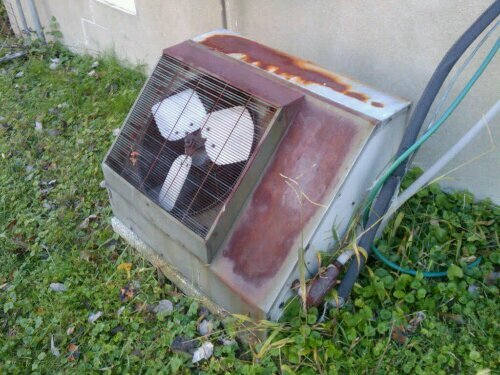 They shouldn’t need a shot of ‘freon’ every year to keep it cooling. “What’s the big deal? Just fill ‘er up.” Well, it is a big deal when you look at all the problems caused by leaking HVAC systems. The first issues deal with detrimental effects on the system longevity. Refrigerant (Freon, R-22, R-410a) circulates oil through the system. If you’re low on refrigerant, oil isn’t returned properly to the compressor. Bearings don’t get lubricated. Compressor life is shortened. You pay more money. Refrigerant is also the cooling medium for the compressor. Say what? Yes, really. The refrigerant passes across the compressor windings to keep it cooled. Compressor runs hot. Windings fail. You pay more money for a replacement compressor or a new system. The second issues deal with ineffective system performance. As the refrigerant leaks from your system, the indoor coil runs warmer and is unable to remove as much heat from the air. This makes the system have to run longer. Running longer results in higher utility bills. Eventually, the system won’t be able to remove enough heat to maintain set point, and you’ll be calling VanKleef Heating and Air Conditioning again. The other part of the performance issue is moisture removal. With a warmer coil, you are not sufficiently reducing the dew point of the air. With a higher dew point, more moisture remains in the air being returned to your rooms. Higher humidity levels in the home result in discomfort and you lowering the thermostat set point. The system runs even longer and you pay more money to the utility. So, before you call for that ‘shot of freon’ consider the long term effects on your wallet and comfort. The wise investment is to let VanKleef Heating and Air Conditioning find the leak and repair it.